When I spoke with Gregg, he told me that since he was little he had always wanted to start a restaurant. He imagined his first restaurant as a pizza place, but negated that idea because pizzas wouldn’t promote health and wellness…something he really strived to do. Last summer his brother, Bruce, was in Manhattan and stumbled across a place called Liquiteria that served health focused juices and smoothies. After talking for a while, they decided that a healthy juice/smoothie and salad bar would be the perfect direction for their new venture. After hearing their ideas and letting them know that I am not only a fitness instructor (obviously health conscious), but am also LEED certified (design environmentally responsible spaces) we decided that we would work very well together. We researched the pros and cons of applying to be LEED certified and came to the conslusion that it would be too expensive and wouldn’t offer us much. Instead, we outfitted the space under the criteria of the Green Restaurant Association while still following the guidelines for a LEED interior build-out. The original space was pretty bare bones, so we didn’t have to do much demolition. We decided to preserve the original bamboo floors, but undertook a risky and long process in re-finishing them. We beat them to hell (with chains, cleats, hammers, and the like) and then rubbed coffee grinds into the crevices to give the floor a worn, multi-dimensional texture. We also re-used the existing acoustical tile ceiling, but raised it up a few feet and painted it a dark brown so that it would mesh well with all of the natural wood without looking too commercial in stark black. The wood used throughout is a natural walnut tree that was chopped down and planed into strips that we then cut down to use in different elements of the space. The countertops in the bathrooms and the bar top in the back of the space were both made from planed strips of this tree. 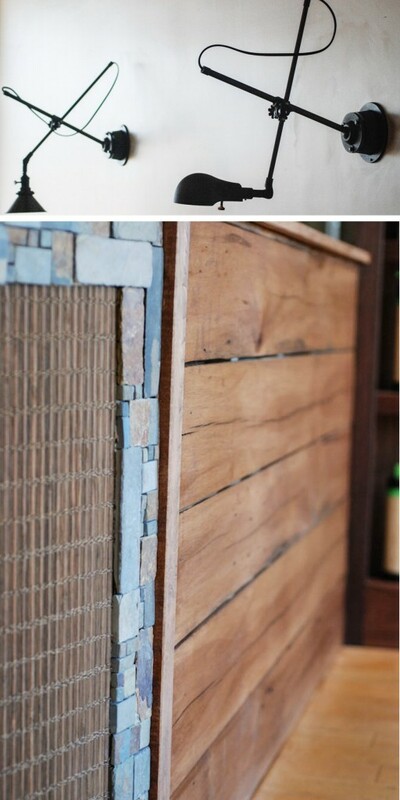 The rest of the wood was used for shelving throughout and cut into 2×6’s for trim. The furniture (tables AND chairs) was all made from reclaimed wood and shipped from within a 500 mile radius (reducing the negative impact of shipping). 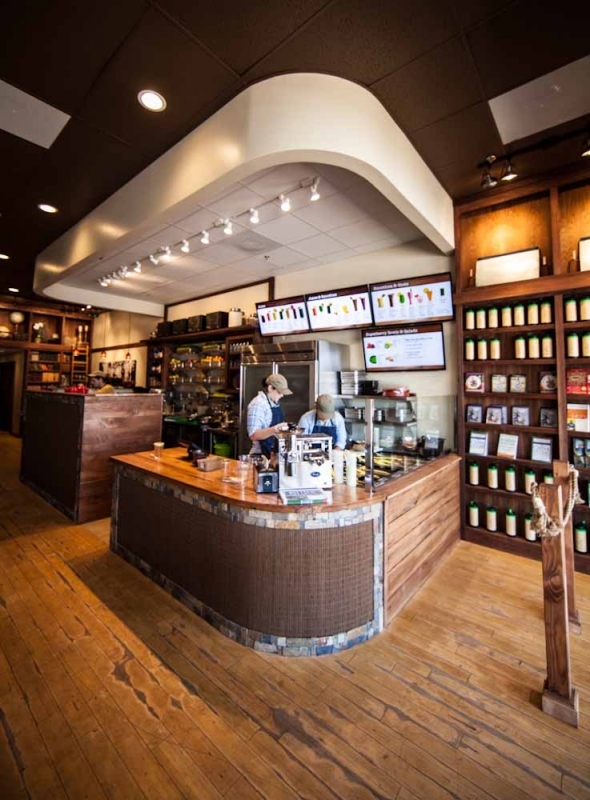 The paint we used is a low VOC paint, the wallpaper is a natural grasscloth, and natural stone tiles were used in the bathroom and on the walls of the counters (with the exception of a code complying tile behind the counter). All of the appliances are energy efficient, including the light fixtures. And of course, my chandelier detail shots….swoon. 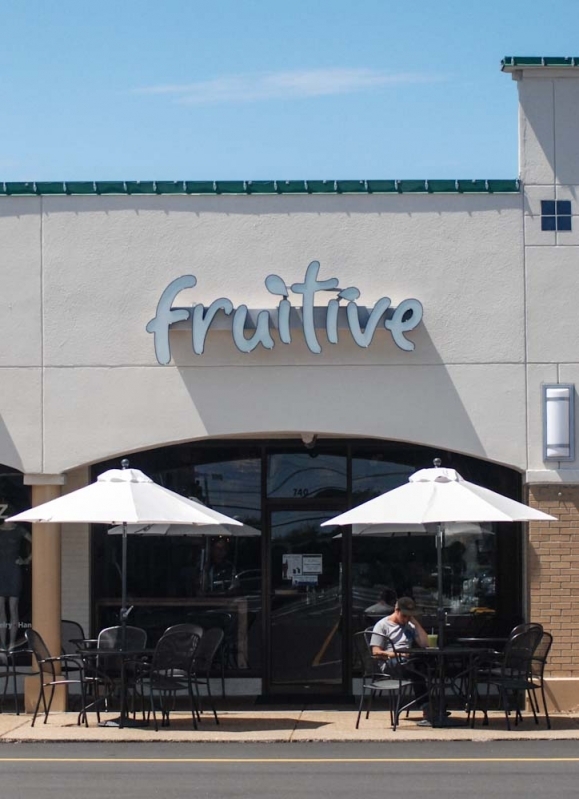 Fun fact: Fruitive is the only Green Restaurant Association certified space in Hampton Roads!! To learn more about green restaurants and what they’re doing for the hospitality world, check this out.